Great Gift Idea - CLICK HERE TO SEE OUR STUFF! Form fitting combed cotton tank top with Choppers.com logo on center chest. One size fits most. Hanes Comfort T with Death Rider design screened on back. 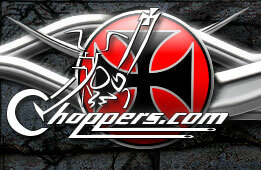 Choppers.com logo front left chest. High quality 6-panel ball cap with rounded bill. Comfortable combed cotton ribbed tank top with Choppers.com logo on center chest. One size fits most. Black and white chopper raglan top with 3/4 sleeves and Choppers.com logo center chest. Comfortable 100% combed cotton feels great! One size fits most.